With all of the uncertainty surrounding the New York Islanders’ arena situation, one would think that Nassau County politicians would lobby for Long Island’s only professional sports franchise to stay in Hempstead past 2015. As the supervisor of the Town of Hempstead, Kate Murray must realize that Nassau County is not financially stable at this point in time. The area around the Nassau Coliseum is a sea of concrete and an eye sore for those that pass through the Uniondale area. Building Long Island’s umpteenth mall/shopping outlet won’t solve the county’s financial woes or attract a younger crowd to come settle in the area. Murray and the Town of Hempstead won’t let Charles Wang buy up the land around the Coliseum or build an arena that will beautify the surrounding area. Instead, Murray believes that it is in the best interests of the County to sever ties with a franchise that brings in revenue on 41 separate occasions during the NHL season. Shutting down the Nassau Coliseum won’t just spell the end of the Islanders, it could result in tremendous losses for an already economically starved Nassau County. Closing down this venue would signal the end of events such as the Warped Tour and many concert performances that are still booked at the Coliseum. In short, Nassau County would have to rely upon an investor to come out-of-pocket and develop the area around the Coliseum if they are to avoid having their already sky-high taxes raised even further. 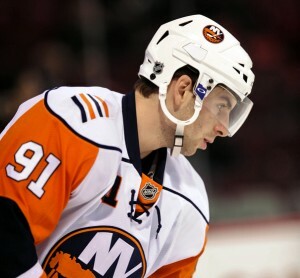 Nassau County politicians seemingly have no interest in negotiating or helping the New York Islanders with their plight. The County owns the Nassau Coliseum, but the way that they treat their residents (Islanders) is eerily reminiscent of the way a slumlord treats his/her tenants. The Coliseum is outdated, has a perpetually leaking roof, and has been improved upon only when Charles Wang has decided to come out-of-pocket for the sake of his team. There are many entities that can be blamed for the Isles’ march into obscurity, but James Darcy’s most recent letter regarding the Islanders illustrates how contradictory and illogical Nassau County politics can be. While we were making these investments, what were Bettman, the NHL and its wealthy owners doing? Seemingly, nothing except casting the occasional stone our way. Well, it’s time for them to put their money where their mouth is. Why can’t the league and its owners put together a financing package for Wang so that he can build his new Coliseum with private funds, in much the same way that former Red Sox owner John I. Taylor did with Fenway Park? Aside from comparing modern-day arena construction to the building of Fenway Park in 1912, Darcy completely misses the point with his assessment. Charles Wang tried to develop the area around the Coliseum (Lighthouse Project) and make it into something that would give Long Island a legitimate attraction, but his plans were viewed as “too grandiose” by Nassau County and its politicians. Now, Darcy is suggesting that Wang build an arena with private funds on land that he cannot own. After reading such comments, which businessmen in their right mind would want to invest their time, money, and effort into a project that would not yield them a profit? The New York Islanders are the residents of Nassau County and the Town of Hempstead, but they are certainly not treated as such. Yet Darcy believes that the Islanders, Charles Wang, and the NHL are the ones that owe Nassau County an unwavering commitment. 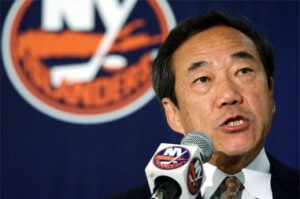 According to Darcy, the Town of Hempstead has been invested in the Isles’ future from day one and that “the town has stood ready to fast-track an application for a new and improved Nassau Coliseum.” If that was the case, and the Lighthouse project was considered to be too big for Long Island, then why won’t Kate Murray approve the sale of the land to Wang and allow him to develop it in a scaled down fashion that appeases both sides? The answer is simple. Kate Murray, James Darcy, the Town of Hempstead, and Nassau County just do not care about the Islanders. Murray, Darcy, and the rest of Team Murray are focused on the re-election campaign, and probably assumed that a letter published in Newsday would boost their image for the November elections. Regardless, Darcy’s letter and sentiments should be viewed with a grain of salt. If Nassau County wanted the Islanders, then a deal would have been in place years ago when Wang was offering to purchase and develop the land. As of recently though, it seems that the Isles’ stay in Nassau County will come to a close in 2015 and that they will see greener pastures elsewhere.